Students venturing in machine learning have been experiencing difficulties in differentiating supervised learning from unsupervised learning. It appears that the procedure used in both learning methods is the same, which makes it difficult for one to differentiate between the two methods of learning. However, upon scrutiny and unwavering attention, one can clearly understand that there exist significant differences between supervised and unsupervised learning. Supervised learning is one of the methods associated with machine learning which involves allocating labeled data so that a certain pattern or function can be deduced from that data. It is worth noting that supervised learning involves allocating an input object, a vector, while at the same time anticipating the most desired output value, which is mostly referred to as the supervisory signal. The bottom line property of supervised learning is that the input data is known and labeled appropriately. Unsupervised learning is the second method of machine learning algorithm where inferences are drawn from unlabeled input data. The goal of unsupervised learning is to determine the hidden patterns or grouping in data from unlabeled data. It is mostly used in exploratory data analysis. One of the defining characters of unsupervised learning is that both the input and output are not known. The primary difference between supervised learning and unsupervised learning is the data used in either method of machine learning. It is worth noting that both methods of machine learning require data, which they will analyze to produce certain functions or data groups. However, the input data used in supervised learning is well known and is labeled. This means that the machine is only tasked with the role of determining the hidden patterns from already labeled data. However, the data used in unsupervised learning is not known nor labeled. It is the work of the machine to categorize and label the raw data before determining the hidden patterns and functions of the input data. Machine learning is a complex affair and any person involved must be prepared for the task ahead. One of the stand out differences between supervised learning and unsupervised learning is computational complexity. Supervised learning is said to be a complex method of learning while unsupervised method of learning is less complex. One of the reason that makes supervised learning affair is the fact that one has to understand and label the inputs while in unsupervised learning, one is not required to understand and label the inputs. This explains why many people have been preferring unsupervised learning as compared to the supervised method of machine learning. The other prevailing difference between supervised learning and unsupervised learning is the accuracy of the results produced after every cycle of machine analysis. All the results generated from supervised method of machine learning are more accurate and reliable as compared to the results generated from the unsupervised method of machine learning. One of the factor that explains why supervised method of machine learning produces accurate and reliable results is because the input data is well known and labeled which means that the machine will only analyze the hidden patterns. This is unlike unsupervised method of learning where the machine has to define and label the input data before determining the hidden patterns and functions. It is also worth noting that there is a significant difference when it comes to the number of classes. It is worth noting that all the classes used in supervised learning are known which means that also the answers in the analysis are likely to be known. The only goal of supervised learning is therefore to determine the unknown cluster. However, there is no prior knowledge in unsupervised method of machine learning. In addition, the numbers of classes are not known which clearly means that no information is known and the results generated after the analysis cannot be ascertained. Moreover, the people involved in unsupervised method of learning are not aware of any information concerning the raw data and the expected results. Among other differences, there exist the time after which each method of learning takes place. It is important to highlight that supervised method of learning takes place off-line while unsupervised method of learning takes place in real time. People involved in preparation and labeling of the input data do so off-line while the analysis of the hidden pattern is done online which denies the people involved in machine learning an opportunity to interact with the machine as it analyzes the discrete data. However, unsupervised method of machine learning takes place in real time such that all the input data is analyzed and labeled in the presence of learners which helps them to understand different methods of learning and classification of raw data. Real time data analysis remains to be the most significant merit of unsupervised method of learning. Data mining is becoming an essential aspect in the current business world due to increased raw data that organizations need to analyze and process so that they can make sound and reliable decisions. This explains why the need for machine learning is growing and thus requiring people with sufficient knowledge of both supervised machine learning and unsupervised machine learning. It is worth understanding that each method of learning offers its own advantages and disadvantages. This means that one has to be conversant with both methods of machine learning before determine which method one will use to analyze data. Jecinta Morgan. "Differences Between Supervised Learning and Unsupervised Learning." DifferenceBetween.net. June 21, 2018 < http://www.differencebetween.net/technology/differences-between-supervised-learning-and-unsupervised-learning/ >. Carpenter, Gail A., Stephen Grossberg, and John H. Reynolds. "ARTMAP: Supervised real-time learning and classification of nonstationary data by a self-organizing neural network." Neural networks 4.5 (1991): 565-588. Fritzke, Bernd. "Growing cell structures—a self-organizing network for unsupervised and supervised learning." Neural networks 7.9 (1994): 1441-1460. Hastie, Trevor, Robert Tibshirani, and Jerome Friedman. 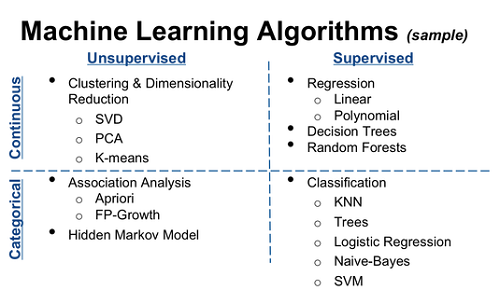 "Overview of supervised learning." The elements of statistical learning. Springer New York, 2009. 9-41.